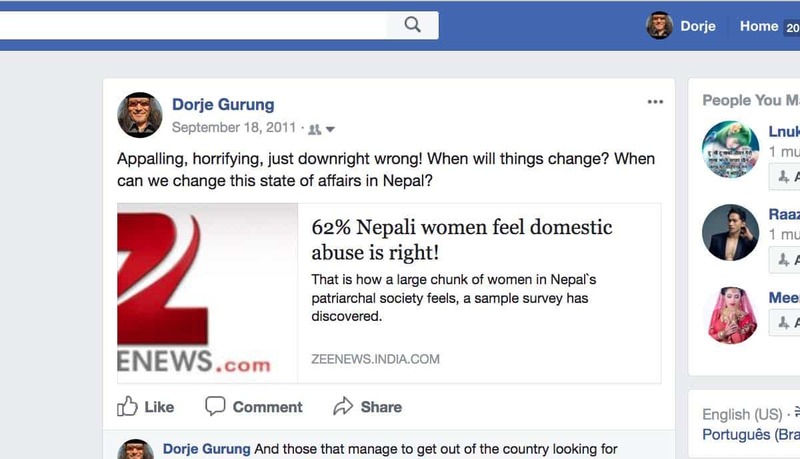 Facebook post I made following my discovery, in September 2011, that a majority of Nepali women feel domestic abuse is right. Click here to go to the article. Click here to go to the source of the data, Multiple Indicator Cluster Survey (MICS) 2010. 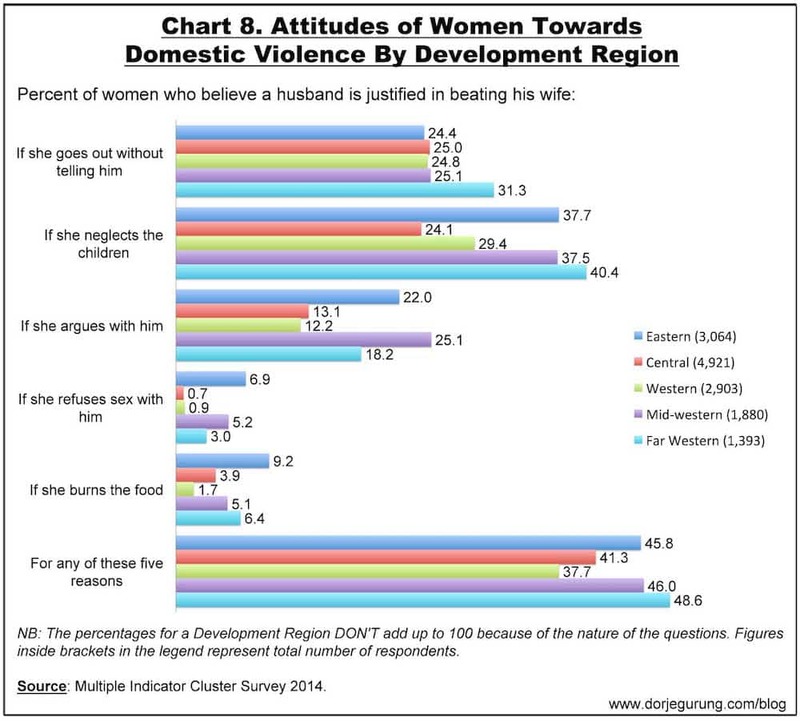 Sometime during my years (2007-10) in Baku, Azerbaijan, reading the results of a study about the attitudes of women in the Central Asian Republics towards domestic violence, I remember being shocked by the fact that 49% thought being beaten up by their husbands for burning food was acceptable. 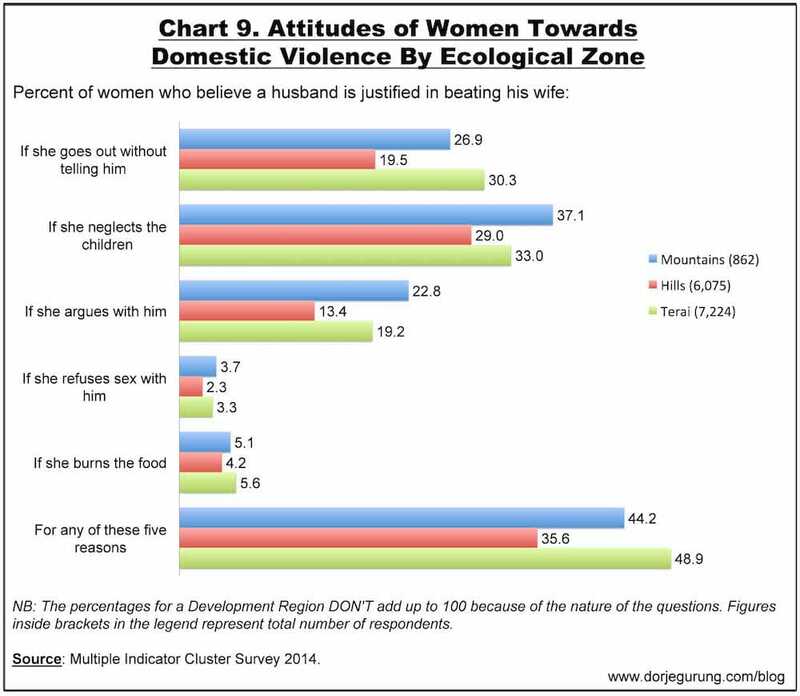 Although I had always known Nepal also had problems with domestic violence and abuse, at the time I didn’t think Nepali women’s attitudes would be that laxed! One of the reasons for that was my belief and understanding that Muslim men, in general, view women as being much inferior to them and treat them very very badly. State religion in most Central Asian Republics is Islam. In “Let’s Raise Children Who Won’t Have to Recover From Their Childhoods”, discussing violence against children in homes and schools, I stated that one would NOT think of Nepal as a violent country…except it IS…”behind closed doors.” And also that, that applies to violence against women. 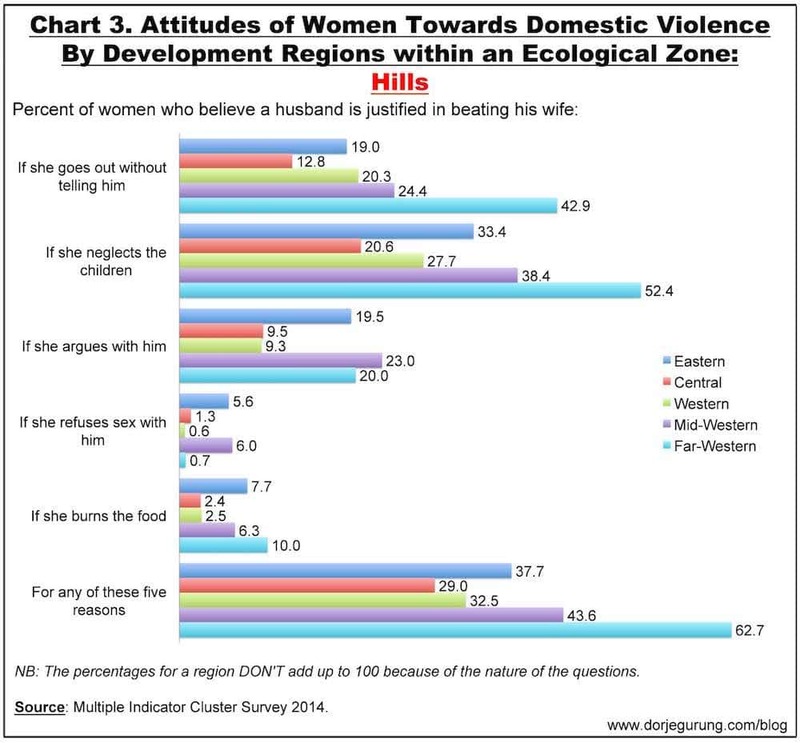 Here are the charts summarizing data from “Multiple Cluster Indicators Suvey (MICS) 2014” about the attitudes of women towards wife-beating to give you an idea about that. Here’s the first one broken down by area. Education and wealth appears to affect attitudes, as one would expect. The following chart shows the difference in attitude by education level. 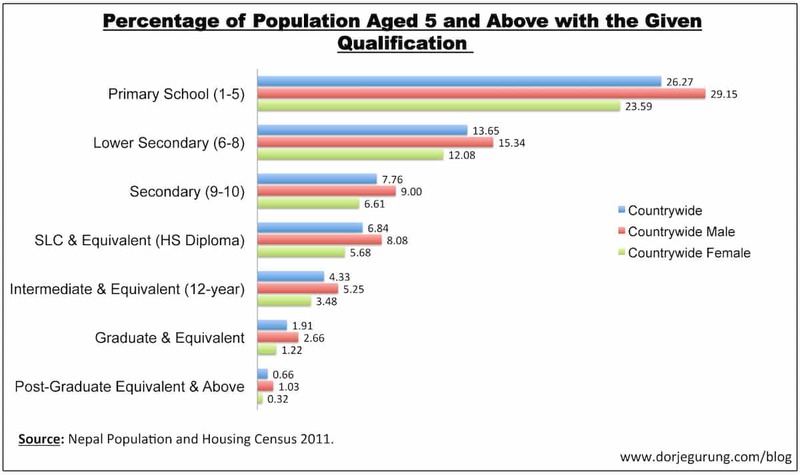 Sadly, higher level of education among women in the country is abysmally low as you can see from the chart below. About 89% of Nepali women don’t have more than a high school diploma (SLC and Equivalent)! The following chart shows variation in attitude by wealth. Education level and wealth, I am sure, partly, if not entirely, explains the significantly different attitudes of women in Kathmandu Valley and the Central Region — where the valley is located — from the rest. The valley probably has the highest concentration of the educated and wealthy in the country. 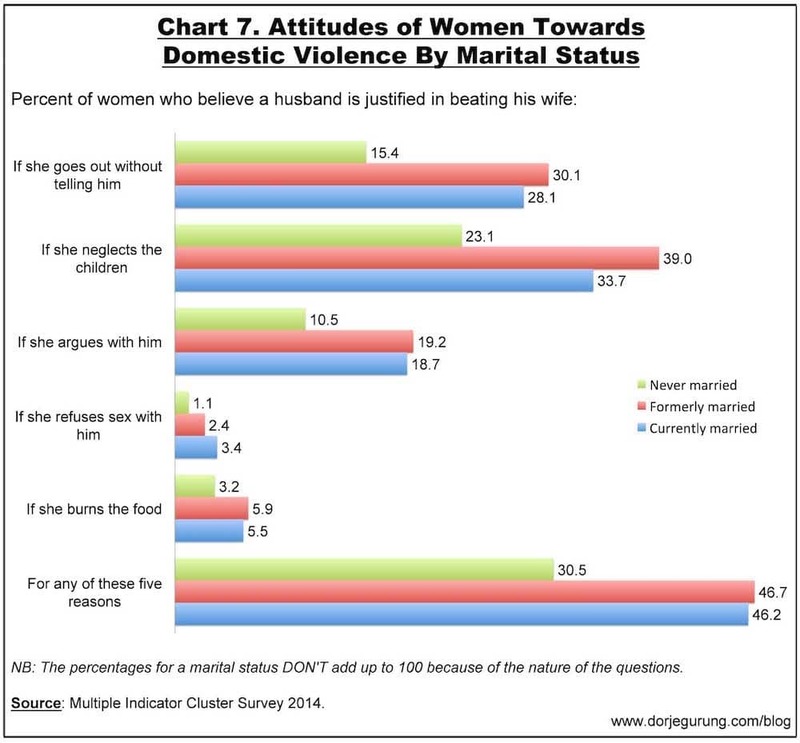 Not surprisingly, attitudes of women vary greatly by marital status as well. Those who were never married are significantly less laxed about wife-beating than both of those who are married and formerly married. Interestingly enough, those who were formerly married appear to be just a little more relaxed than those who are still married! That is significant for another reason: about a third of Nepali women aged 10 and above, according to the 2011 census report, never married! The country is extremely diverse geographically, culturally and ethnically. 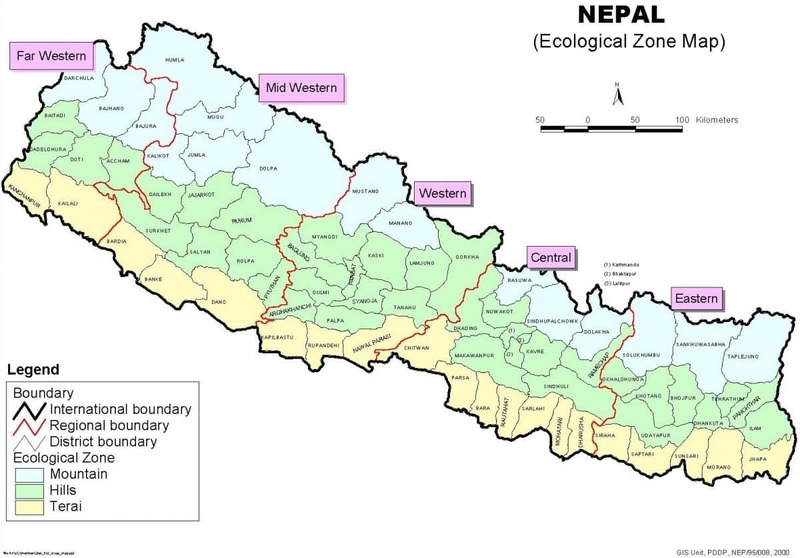 Geographically, it is divided into three Ecological Zones, and politically into five Development Regions as shown below. There is obviously significant variations in culture, ethnicity, as well as the local economy between Regions and Zones. 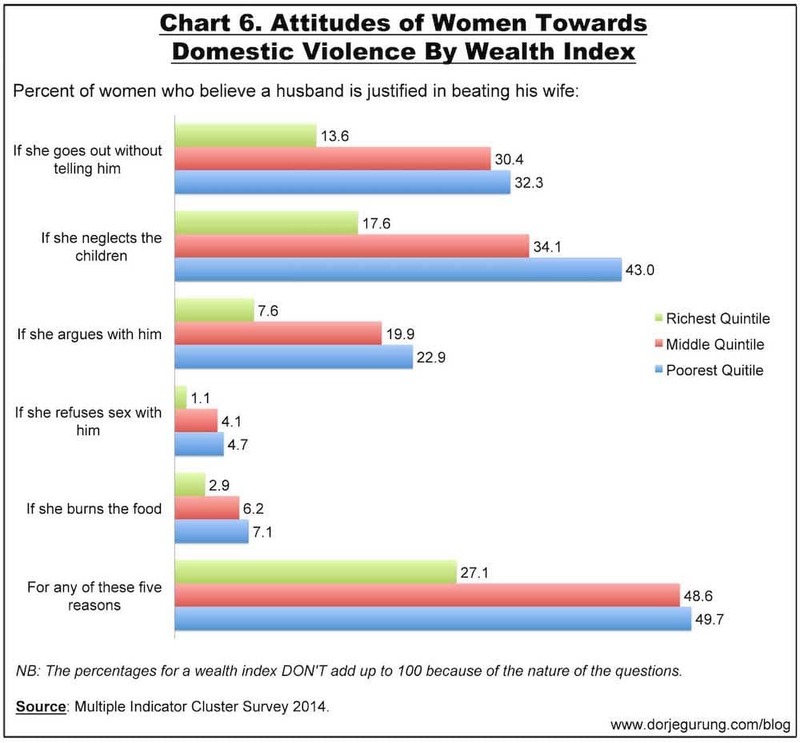 That variation is also, of course, reflected in the attitudes (and behaviors) of the people, including women’s attitudes towards domestic violence. The following two charts show that variation by Regions and Zones. The following three charts show the variation in attitudes among Development Regions within each of the Ecological Zones. 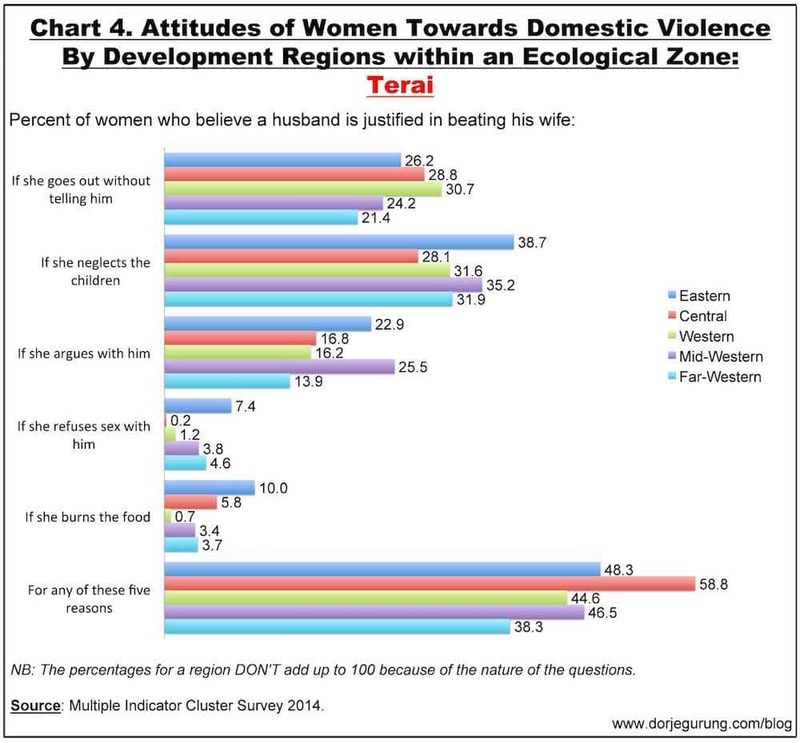 So, while our women’s attitudes towards wife-beating might not be as bad as those of Muslim women in Central Asian republics, it’s still bad enough to be of concern for all of us. To be sure, this laxed attitude did not develop in isolation, on its own, uninfluenced by anyone else or anything else in our society. Women did not — and do not — come to hold such attitudes just out of the blue. We just have to look at us, the men, to find some of the explanations for that. That the man is superior to the woman is widely believed and accepted in the country. That it’s a man’s duty (and also part of his manhood) to put women “in their place” (taha lagaunu) is also widely accepted “wisdom.” We also have a Nepali saying that goes something along the lines of “Pothi baseko ramro hoina” (a hen crowing is not good). No wonder, casual sexism, deplorably flagrant misogyny and domestic violence in the country are just accepted as facts of life! Except, as far as I am concerned, boys and men reinforcing their sense of superiority over females through violent means is displaying their insecurity, among other things. We, the men of Nepal, are a very very insecure bunch. The other issue is lack of quality education. 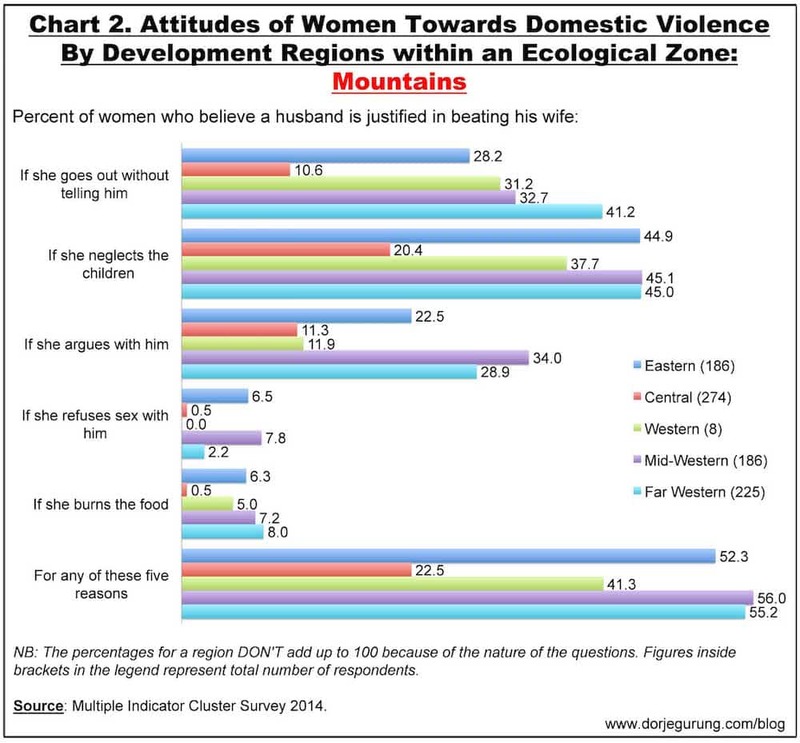 I can confidently say that there will be Nepalis who read this blog post, look at the charts, and blame the women for having such laxed attitudes towards wife-beating, completely unaware of, or unwilling to recognize, the context which fosters attitudes such as these and lead to their crystallization! The culture that shapes these attitudes is also the culture in which almost 40% of the population suffer from mental health disorders, for instance. I am pretty certain that significantly more females suffer from mental health issues than males, otherwise the biggest killer of females of reproductive age probably would NOT have been suicide for as long as it has been. 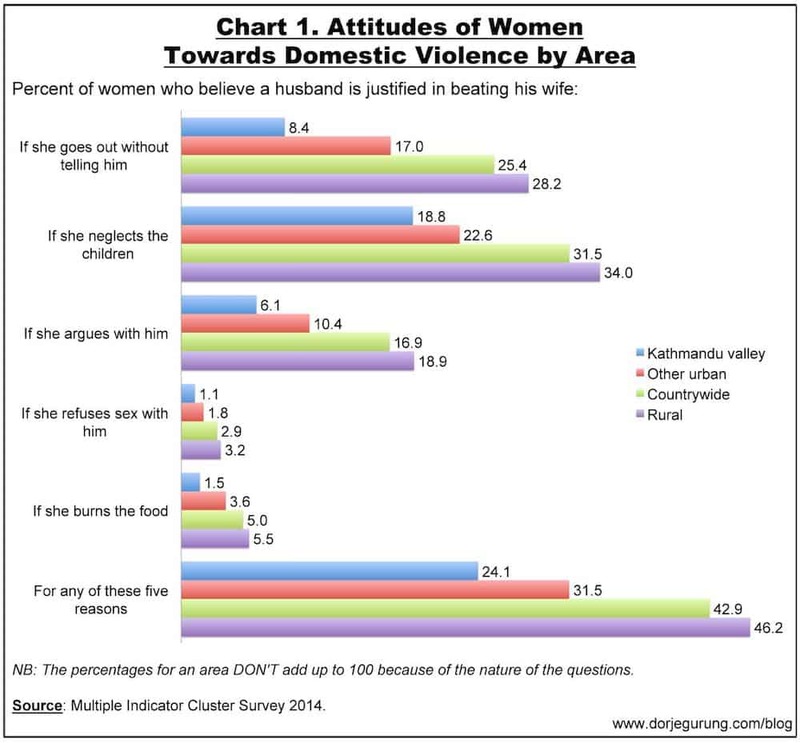 Of course addressing the issue of Nepali women having such laxed attitudes towards domestic violence requires a multi-prong approach. There are economic issues as pertains to gender that have to be addressed, structural issues in politics and society need to be addressed, laws related to citizenship and inheritance need to be addressed, girls’ access to education needs to be addressed — to give but just four examples. That quality education by necessity must include opportunities for discussion and debate in schools, at colleges and at other institutions about domestic violence (and other social ills) so that the issue does not continue to remain a taboo subject, supporting — and in some instances even encouraging — the men to continue engaging in it with impunity. Not surprisingly, the twisted mentality prevalent in our society — thanks to patriarchy — is such that stigma is associated with being a victim of domestic violence, NOT with being a perpetrator! In discourses about domestic violence (and gender-based violence) in general, we must also change the way we talk about it as identified in the image below. 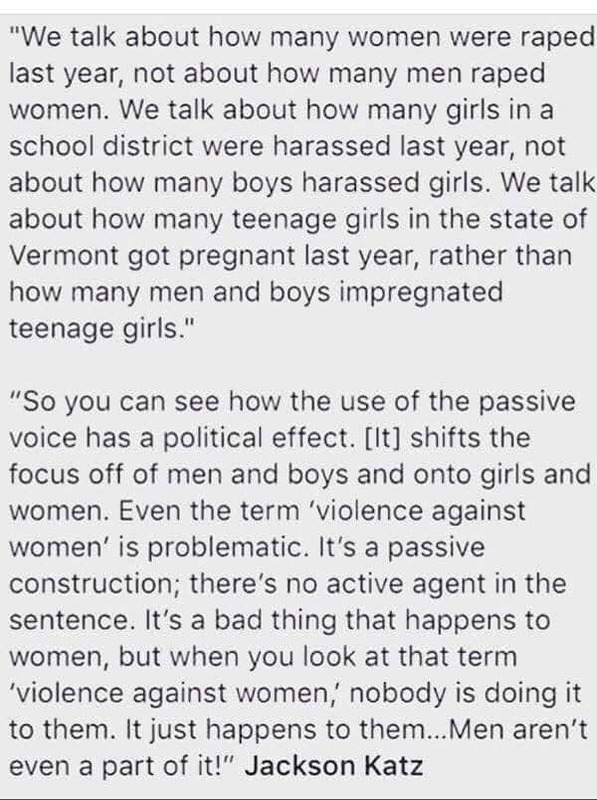 In other words, we need to start talking about gender-based violence in the active voice. We need to put the spotlight on the perpetrators. We need to put the spotlight on men, the gender whose attitudes and behavior predominantly shape pretty much everything about our society and influence the attitudes of women, such as their laxed attitude towards domestic violence. 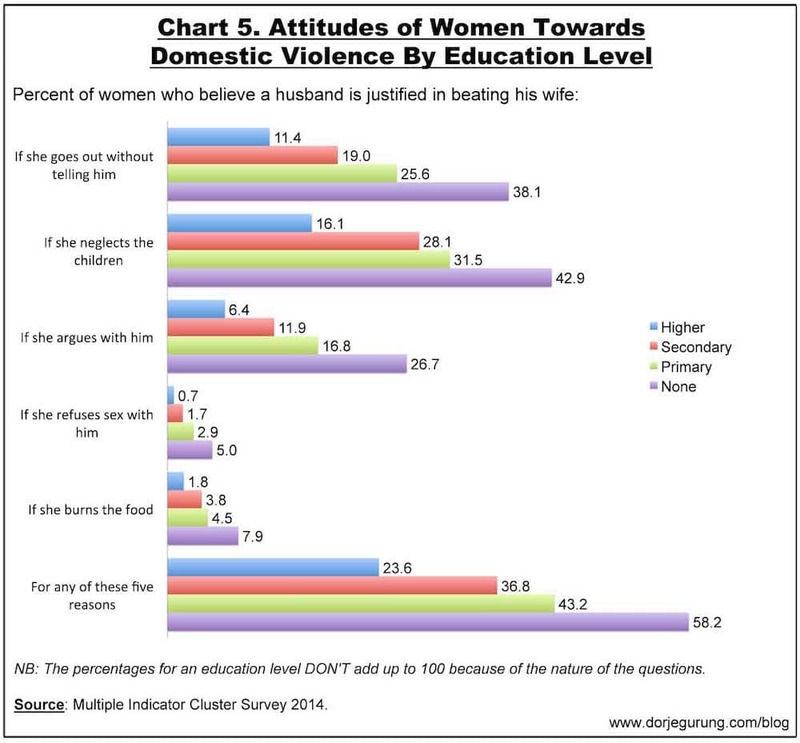 We know the attitudes of women towards domestic violence. Do we know the attitudes of boys and men? We do anecdotally but I don’t think we have results of similar surveys because they might never have been conducted. I am not aware of any anyway. But, that’s something we need to do. We need to get answers to questions such as the following: How many boys and men are even just willing to answer questions about domestic violence in their own homes, to begin with? Those who are willing to respond, the next question could be about whether they have beaten their partners for any of those reasons enumerated in the MICS2014 survey. The next question, to those who do beat, or have beaten, their partners could be about the justification behind their violent reaction to what they perceive as “transgression.” Somewhere there, they could be asked about the frequency with which they beat their partners. All of that, incidentally, is NOT to insinuate that there is no domestic violence against boys or men or against other genders in the country. Of course not! I am in NO way implying that! Even if obvious, I mention that here because of how Nepalis in the past have questioned me about that in our discussions about gender issues.